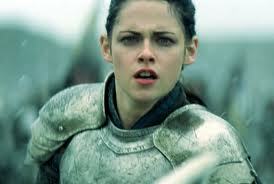 “Snow White and the Huntsman” surprised Hollywood pundits with a $56 million box office haul in its opening weekend. We might be able to chalk this up to teenagers who want to see Kristin Stewart or men who don’t get mind getting dragged to see a Charlize Theron movie, but it’s also clear that the character of Snow White is having a moment right now. First came “Mirror, Mirror,” the family-friendly atrocity that starred Julia Roberts as the Evil Queen. There is also “Once Upon a Time,” the well-reviewed ABC series that has just been renewed for a second season. Now we have “Snow White and the Huntsman,” a gritty, serious adaptation of the famous Brothers Grimm tale. While it is clear that the story of a young innocent triumphing over a greedy and malicious civic leader is resonating with viewers at this particular moment in history, it is equally clear that no one has gotten the story quite right yet. “Huntsman” fails at nearly every level, from its bland, generic action sequences to some very poor casting decisions. But one thing it gets very right is its portrayal of the evil Queen. First-time director Rupert Sanders and his screenwriters clearly recognize that her character is the most compelling, so they script for her a dramatic rise to power and cede to her the bulk of the early screen time. The opening scenes of “Huntsman” do what the rest of the movie does not: provide an original take on the famous fairy tale and, in doing so, a reason for it to exist. Queen Ravenna (Theron) comes to power through literally the oldest trick in the book. Still grieving over the recent death of his wife, King Magnus falls in love with the prisoner of a defeated army. This is Ravenna, a blond-haired beauty who captures the king’s grief-stricken heart. He quickly marries her, unaware that he is letting a Trojan Horse into his kingdom. After killing the king and assuming the throne, she banishes the kind, lovable princess, Snow White, to the tower instead of killing her, presumably so she can grow up, escape, and kill her in the film’s third act. These early scenes succeed on the back of Theron, the only actor who approaches her role with the appropriate level of seriousness – which is to say, very little. She understands how ridiculous this story is, so she screams, flails, and thrashes her way through the film in a wonderfully campy performance. She is a lot of fun to watch. As her on-screen counterpoint, Kristin Stewart takes the opposite tack. Her Snow White is a sullen teenager, or, in other words, a Kristin Stewart type. When Ravenna sends a drunken huntsman (Chris Hemsworth) into the Dark Forest to capture Snow and return her to the castle, she barely puts up a fight, and the Huntsman catches her easily. Good thing he falls in love with her and decides not to allow the Queen to eat her heart. Which is too bad because I found myself hoping that would happen. Stewart’s princess is a helpless victim for much of the film, and she never garners much sympathy. Although the script gives her moments of leadership, Stewart, with her low-lidded, stoner eyes and tiny frame, cannot sell them. As she approaches the castle in her chain-mail miniskirt and ponytail for the final showdown, I found myself rooting for the Queen, not because she deserved to win or because I like evil or anything, but because then at least we would get to see more of her in the sequel, which is already in development. But how strange it is that, in both recent Snow White films, it is the villain that resonates most with audiences. This is not a normal phenomenon. Of course, villains are always more colorful, but a good action-adventure tale is based on strong and immediate audience identification with the hero. So why do these movies lead with their villains? To answer this question, we have to understand why we are seeing so much of Snow White these days in the first place. For many years, “Cinderella” was Hollywood’s go-to fairy tale, but it has clearly been replaced by Snow White. But what makes these stories different? Both Cinderella and Snow White are young, female protagonists who struggle with abusive parental figures. However, the disparate natures of their struggles – and their rewards – is illuminating. Cinderella’s plight is a practical one. She starts out poor and put-upon and ends up rich and powerful. It portrays wealth as a social panacea. But Snow White’s struggle is ideological. It pits good against evil, light against darkness, and these films reflect a far uglier world than the Cinderella stories of years past. Further, these themes of inter-generational resentment and conflict are impossible to avoid in movies right now. In addition to the Snow White films, both “The Hunger Games” and “Cabin in the Woods” portray a generation of young people fed up with being used and dehumanized by adults. But why was it so easy to root for the heroes of “The Hunger Games” and “Cabin in the Woods” and so hard to root for Snow White? I think it’s because young people have a new idea of who the enemy is, and “Snow White and the Huntsman” does not understand this. “The Hunger Games” and “Cabin” see the enemy as a faceless system of oppression. There is no single villain causing trouble for our protagonists in those films; instead, the sources of their suffering are long-held traditions in which the youth are sacrificed for the good of society. These stories speak to an entire generation, currently coming-of-age, who blame the Baby Boomers for abandoning the principles of their youth and creating the problems, whether fiscal, environmental, or political, with which we are all burdened today. As President Obama likes to say – this will be the first generation of Americans who have things worse off than their parents. And as Tyler Durden likes to say, they “are very, very pissed off” about it. But the Snow White movies posit that our struggles all come down to a very simple dichotomy of good and evil, and audiences simply do not see the world that way anymore. Ravenna may technically be the “bad guy,” but I have a sneaking suspicion that many Americans are far sympathetic to her than they are to Snow White. If they are not rich, powerful, and beautiful, they certainly want to be. While we can root for Snow’s innocence and goodness to win the day, our culture glorifies the beauty, strength, and power exemplified by the Queen, so that is where our attention, if not always our sympathy, lies. In other words, they may be telling the story of Snow White, but we are still living in a Cinderella world. you are sooo wrong on so many levels. i personally think it is a true telling of a disney bastardize exciting story. if u lived in the world portrayed there would not be long thought out fight seen there would be flailing falling and ugly fighting all in a effort not to die. u dont need a pretty looking fight to make it real and authentic.